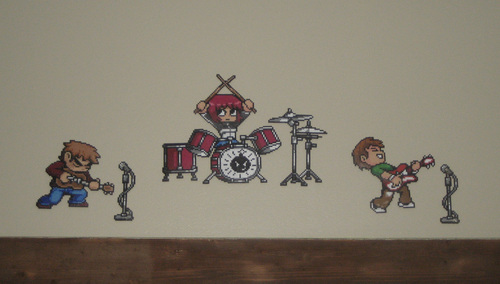 Scott Pilgrim Original Bead Art by Pixelated Production. . HD Wallpaper and background images in the Scott Pilgrim club tagged: scott pilgrim comic book comics characters ramona flowers kim pine scott pilgrim vs. the world movie knives chau. This Scott Pilgrim fan art might contain sign, poster, text, chalkboard, fleur de lis, and fleur de lys.